PRINCETON, N.J. -- U.S. small-business owners continue to be less optimistic about their financial situations in the fourth quarter than they were at the beginning of 2015. 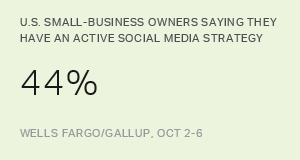 The Wells Fargo/Gallup Small Business Index declined modestly but steadily in the second and third quarters of this year, after its significant rise in the first quarter. In the quarterly small-business survey conducted Nov. 9-13, the overall index score, which measures small-business owners' optimism, dipped to 54, continuing a downward trend from 59 in the third quarter, 64 in the second quarter and 71 in the first quarter of this year. The last time the index declined for at least three consecutive periods was from Quarter 3, 2007, through Quarter 1, 2009. The index has lost the ground it gained late last year and early this year, but remains higher than the 49 recorded in the third quarter of 2014, before the most recent spike in small-business optimism. The index consists of two parts -- evaluations of present business conditions and expectations about the future. Both components have been declining in roughly parallel tracks this year, suggesting that the dip in small-business optimism is more of a general pattern than one that reflects disproportionate concern about the present or the future. Expectations that company revenue will increase are the lowest since Quarter 4, 2013. Currently, 47% of small-business owners report that they expect their revenue to increase, compared with 51% in the third quarter. Optimism about revenue growth has not been this low since 44% anticipated increases two years ago. Owners' expectations for their businesses' financial situations in the next 12 months dropped modestly. Currently, 70% of small-business owners expect their financial situation in a year to be very or somewhat good, compared with 74% in the prior two quarters. While not a significant change, the small decrease contributes to the overall pattern of decline. Positive reports of revenue have changed little. In the third quarter and now, 39% of small-business owners reported that their company's revenues increased over the past 12 months, down significantly from 49% in January, although down only modestly from 42% in the second quarter. Even as the overall index has declined, the 26% of owners who say the number of jobs at their company will be increasing over the next 12 months is actually higher now than it was in the robust first quarter of this year, and is tied for the highest since 2007. 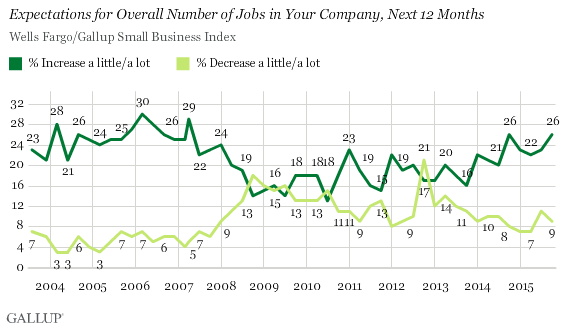 Small-business owners typically are more likely to report they will add jobs than subtract them. Even during the recession and recent periods of high unemployment, owners were still about as likely to say they believed they would increase their staff as to say they would decrease it. But the gap between expectations of increasing and decreasing staff is now one of the largest seen since before the recession. As is usually the case, the vast majority of owners, roughly two-thirds, expect the number of workers at their company to stay the same. The survey also asks owners if they have hired or fired workers over the past 12 months, and 17% report that they have hired over the past year, while 14% say they have let workers go, leaving the significant majority who say they have not changed the size of their workforces. 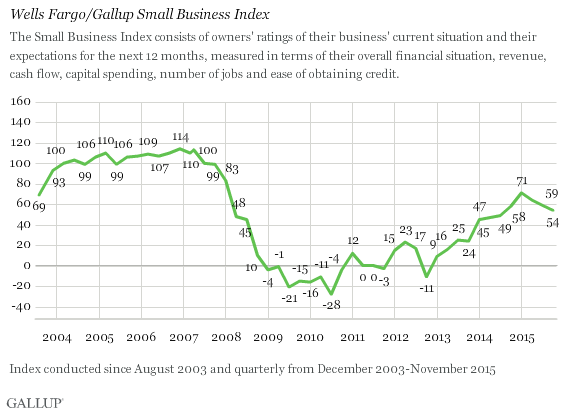 Small-business owners' optimism about business and financial conditions has continued its modest path of erosion in the fourth quarter of 2015, although the Wells Fargo/Gallup Small Business Index remains high relative to its low levels from 2008 through late last year. Despite this downtick, owners are as positive about adding new jobs over the next 12 months as they have been in eight years. Results are based on telephone interviews with 606 U.S. small-business owners in all 50 states, conducted Nov. 9-13, 2015. The margin of sampling error is ±4 percentage points at the 95% confidence level. 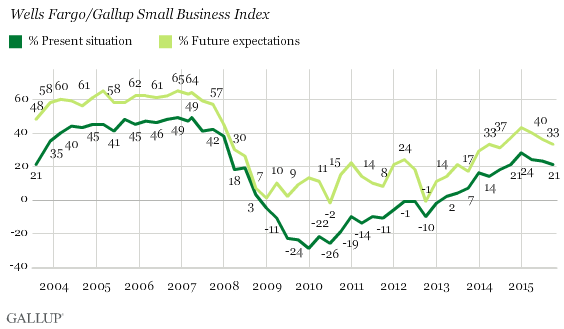 Americans are more than three times as likely to express confidence in "small business" (67%) as they are in "big business" (21%), consistent with their attitudes in previous years. Many small-business owners are unaware of the pending EMV changes in credit card liability, including half of those who currently accept credit cards. Owners' optimism about business conditions continues to trend down.